you need to create the CD structure, and then set files. For this tutorial i will use the folder Workspace as the main folder and ISO the folder which will contain the iso files. If you use another Linux distribution (or even older Debian), files can be find in some other directories, you may have to search them before. File are taken from the BIOS directory, the boot process won't work if EFI files are used instead. MENU TITLE "THIS IS A TEST"
This menu isolinux.cfg is just displaying one entry, which when selected it launch the local hard drive boot process. genisoimageWill be used to create the bootable iso file. genisoimage has replace mkfsiso, but it works the same with mkfsiso, the command line should be a little different, but the result should be (almost) the same. Once the iso is generated, it can be tested. To test you can use for example a virtual machine with boot on CDrom option and the iso mounted in CDrom. By the way, the script can be put in a single bash file to make the whole process. You may have a trouble in your isolinux.cfg, for exemple a bad use of INCLUDE can make infinite loop. Try to comment some part of code until iso boot, you may find the problematic line. That mean you are using the wrong files (EFI files), you have to use BIOS files and not EFI to have a working bootable support that is started by computer BIOS. "Failed to load COM32 file Menu.c32"
error message "all to search_tree_file with an absolute path, stripping initial path separator. Hope this was intended... genisoimage: Uh oh, I cant find the boot catalog directory '/var/tmp/Workspace/ISO/isolinux'!" Example : the option "-b /var/tmp/Workspace/ISO/isolinux/isolinux.bin" will search isolinux.bin in "/var/tmp/Workspace/ISO/var/tmp/Workspace/ISO/isolinux/isolinux.bin"
error message "genisoimage: Uh oh, I cant find the boot catalog directory 'isolinux'!" Now you know how to create bootable iso, but it need to be more usefull than just offering an option to boot on local hard drive. 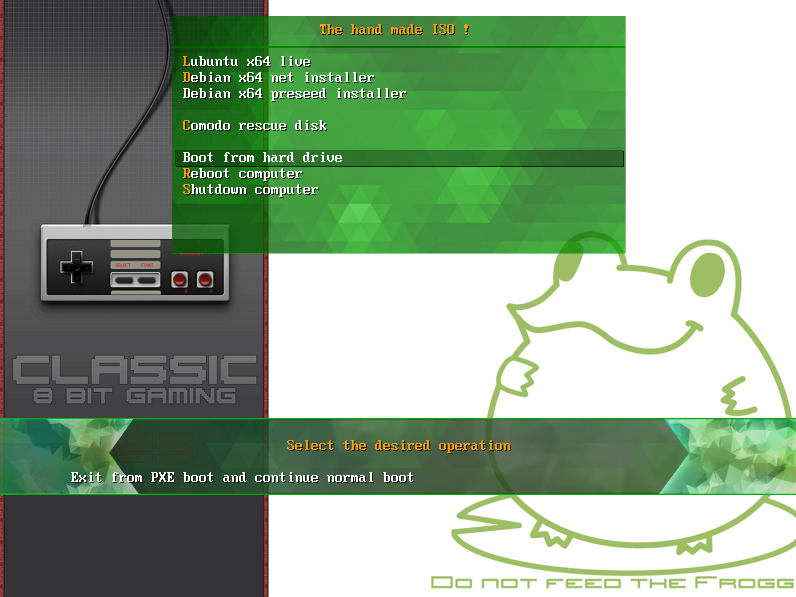 So next step is to add stuff to boot menu, customizing it, and then export the result to USB ! To not download/install more stuff, we will basically use the one from Syslinux files. We will use reboot.c32 (reboot the compuer) & poweroff.c32 (shutdown the computer) files from Syslinux. Files are taken from BIOS folder, once again if files are taken from EFI folders, it won't works ! For the next steps, iso file can be used, i will explain in this part how to extract files from an iso, but if you use a compressed package (like tar.gz) this step can be skipped. You can find some other by searching on internet. There is lot of tools available to do this, the most common is to use Winrar to open an iso file, or Daemon tools to mount an iso file. For this section, I will use Lubuntu live & Commodo recue disk as example. For an iso, it will be easy, just the iso requier to be copied on the Workpsace and will be start using the tool memdisk from Syslinux files. For a live CD like lubuntu only some files are requiered (squashfs, initrd, vmlinuz found in casper folder). For this section, I will use Debian Jessie as example. At the moment i didin't found how to install from the full installer with a custom path, an error occur : "Incorrect CD-ROM detected. 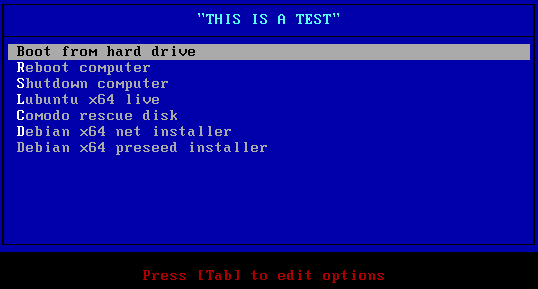 The CD-ROM drive contains a CD which cannot be used for installation"
Once generated, you can test the iso file on a virtual machine for example. And each entries should works ! The common error message is initramfs unable to find a medium containing a live file system theat mean the APPEND parameter line should contain errors. Be sure ignore_uuid command is present in APPEND line, and check the path you set in the isolinux.cfg file. Check the command live-media-path, it must point on sqhashfs file folder, and not directly on the file. Ok, now the content is there, but display is like from the 80's, it really need to be pimped to look like modern stuff ! To enhance interface, we need to use more than menu32.c32 which is limited, there is some libraries to do it, but for the next steps we will use vesamenu.c32 available in syslinux package. You can set an background image to make the display look really better. MENU TITLE The hand made ISO ! So, now we have a bootable iso with lot of stuff on it, what could we do more ? You need to know that the following method will make the key not readable on Windows system. The key can be formated on Windows if need to works on it, but data cannot be read ! To find your usb on the system, yuo must have connected it first, then you can find it using command lines. There is multiple ways to do it. using the command "fdisk -l"
Make sure you are copying iso to USB Key (sdb in my case), not on his partition (sdb1). Now you can test it, by booting on it (by the way not all computer can do this operation). To set computer boot on USB Key you have configure computer BIOS boot order. -1 (minus one) : Cause the boot loader to report failure to the BIOS, which, on recent BIOSes, should mean that the next boot device in the boot sequence should be activated. Syslinux use APM to shudown the computer if it is disabled or doesn't available, shutdown won't work. As the code is in bash it is open source and easy to modify if required. By the way I allow to use and modify it without any credits, for any kind of use (private or even commercial). Once finished, don't forget to clean your Workspace !